Brief review of the 32nd Executive Committee Meeting held in Monaco, on 10 ? 11 April 2017. 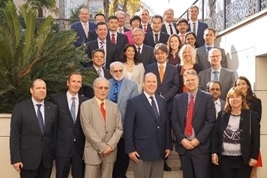 The Executive Committee (ExCo) of the Technology Collaboration Programme on Ocean Energy Systems (OES), within the International Energy Agency (IEA), announces the outcomes of its 32nd meeting, held in Monaco, on 10 – 11 April 2017, in the presence of HSH Prince Albert II of Monaco and 20 representatives from the organisation member states. On the occasion of this event headed by the Monegasque National Committee of the World Energy Council, in partnership with the Government and the Prince Albert II of Monaco Foundation, Mr Henry Jeffrey, Chairman of the OES, presented the Ocean Energy Systems 2016 Annual Report to the Sovereign. • Ocean Energy in Insular Conditions – a new report will be soon published with results of the workshop looking at the opportunities and barriers to local adoption of ocean renewable energy in islands and remote coastal areas of the Asian region from the perspectives of various stakeholders and the possible solutions to address the challenges. AUSTRALIA observer - Australia's long coastline is a massive potential source of ocean energy. A new industry body has recently been formed consisting of developers and energy companies. There are a number of developers active in wave energy: Bio Power Systems is progressing with the development of the bioWAVE pilot and testing is planned for 2017. The company has also developed its PTO module as a standardised self-contained system, suitable for use by other wave energy devices. Bombora Wave Power is developing their wave energy prototype. Carnegie Clean Energy has plans for a large scale project in Albany, on the southern coast of Western Australia. Wave Swell Energy is a new Australian company developing an innovative wave energy technology. The construction of the concrete structure and turbine manufactured are expected to occur in 2017. The CEO of this company attended the 32nd ExCo OES meeting as Observer. CHILE observer - Chile has a tremendous potential for marine energy, especially tidal and wave energy. MERIC (Marine Energy Research and Innovation Centre), inaugurated in June last year, is building high level expertise in this field. This is an initiative from DCNS and ENEL Group, in partnership with Chilean academic institutions and with support from the Chilean economic development agency CORFO, taking an active role on marine energy development in the country. The CEO of MERIC attended the 32nd ExCo OES meeting as Observer. A new interactive web map - Nova Scotia Tidal Energy Atlas - is now available, displaying and providing tools to view and manipulate tidal energy related spatial data. An online supply chain database has been released by Marine Renewables Canada. There is also an interactive Map of Clean Energy Resources and Projects (CERP) for learning about all clean-energy resources and projects in Canada. The Fundy Ocean Research Center for Energy (FORCE) has been conducting an extensive environmental effects monitoring programme to better understand the natural environment of the Minas Passage and the potential effects of turbines that will be there deployed. A complex system of underwater monitoring platforms - Fundy Advanced Sensor Technology (FAST) - has been developed. There are currently four berths held by four groups: Back Rock Tidal Power, Minas Tidal, Cape Sharp Tidal and Atlantis Resources & DP Energy. Cape Sharp Tidal deployed 2MW in-stream tidal turbine at the FORCE site in Nov, 2016. This demonstration turbine was designed and manufactured by OpenHydro. Several Canadian companies have been progressing in the past months: In British Columbia, the WaterWall turbine was installed last year on Dent Island and Mermaid Power launched its wave energy device Neptune 3 off Vancouver. New Energy Corporation has been awarded a contract to provide a hydrokinetic power generation system to a community in Manitoba. In December last year, the Chinese Government release their 13th Five-Year Plan for Marine Renewable Energy. Within this plan, four test sites are planned: Shandong, Zhejiang, Guangdong and Hainan. At one of these sites - Wanshan, Guangdong - 3 devices will be deployed, one of which through international procurement. The total governmental budget for ocean energy projects for 2017 is RMB 137 million. Small tidal current turbines are being tested under R&D programmes: The 100 kW wave energy prototype Sharp Eagle-Wanshan has completed 6 months of sea trial in Wanshan Islands and an upgraded device has been installed last month. The Institute of Electrical Engineering of the Chinese Academy of Sciences installed a tidal turbine (2×2.5kW) near Xisan Island. The Harbin Institute of Technology has completed the design and construction of their turbine. The first Institute of Oceanography of State Oceanic Administration has been developing a 10 KW OTEC prototype and is now undergoing experimental tests. Jiangxia Tidal Power Plant operated by China Longyuan Power Group Co since 1980 has been upgraded last year. LHD tidal current demonstration project (3400 kW) has now two of the 7 turbines installed. It has been grid connected since August 2016 and generated over 170 MWh. The 6th China Marine Renewable Energy Conference will be held in Zhuhai, Guangdong Province on 25-26 May 2017, hosted by the National Ocean Technology Center (NOTC). A new Handbook of Ocean Wave Energy has recently been published in Denmark, offering a practice-oriented reference guide to the field of ocean wave energy. DanWEC (Danish Wave Energy Test Centre) is managing two test sites at the west coast of Denmark: a small scale inshore facility at Nissum Bredning and a full scale site outside Hanstholm Harbour. DanWEC supports wave energy developers with application for permits and supply design and wave data for the site. Four Danish wave energy technologies - Floating Power Plant, Wave Dragon, KNSwing and Leancon - all at the offshore prototype development stage, are working together on a national funded R&D project “Mooring solutions for large wave energy converters”, investigating and comparing different mooring solutions. It is a 3-year project with €1 million funding that will finish by the end of this year. Other active Danish developers - WavePiston, Weptos, Crestwing and Resen Waves – are progressing in the sea. The Ocean Energy Strategic Roadmap is a recent important milestone of the European Commission, identifying key actions for supporting investments and de-risking ocean energy. Another key reference document is the European Strategic Research Agenda for ocean energy, which resulted from the European Technology and Innovation Platform for Ocean Energy (ETIP Ocean). It is expected to continue to evolve with further dialogue with the ocean energy community. Several EU mechanisms support the development and demonstration of ocean energy technology towards commercialisation. Horizon2020 is now funding 9 projects supporting demonstration of wave and tidal energy converters from TRL 5 to 9, in total €54 million, with the involvement of the following European wave and tidal companies: Tocardo, Ocean Renewable Power Company, Nova Innovation, CorPower, DEME Blue Energy/Atlantis, Scotrenewables, Wello Pinguin, OceanTEC and Minesto. The French Government announced in March that a call for tenders for commercial tidal stream farms will be launched during this year: 2 macro-zones of interest have been designated, which can accommodate projects of 50 – 100 MW. France has three test centres now active, fully equipped and grid connected: SENNEOH, SEM-REV and Paimpol-Bréhat. SEENEOH is a tidal estuarine test site at Bordeaux located upstream the largest estuary in Europe, the Gironde Estuary, with 3 berths and a total capacity of 250 kW; four different technologies are on the list to be tested: Hydrotube Energie, Instream Energy Systems, Bertin Technologies and HydroQuest. SEM-REV is the open sea test facility for wave and floating offshore wind devices, located on the west coast, offshore Le Croisic. The GEPS Techno company which is developing multi-use platforms will test a 100 kW floating WEC device. In parallel and in the framework of the Floatgen EU project, IDEOL will also test a 2 MW prototype floating wind turbine. Paimpol-Bréhat, in North Brittany, is a tidal energy test site operated by EDF where two different projects will be tested: 2x1 MW Openhydro turbines already at sea and soon after the 1-MW HydroQuest turbine. 9 organisations from France and the UK have partnered to tackle the challenge of energy vulnerability in areas located at the end of the electricity distribution network and dependent on fossil fuels: the ICE project (2017 – 2020), “Intelligent Community Energy”, is dedicated to improving, developing and promoting new smart solutions for energy production, storage and consumption for an island or remote community. This project will be funded by the France (Channel) England Programme through the European Regional Development Fund (ERDF). In this framework, the D10 Sabella tidal turbine will continue with its demonstration installation at Ushent, an island at the western end of Britanny. A first assessment of marine renewable energies related jobs (in French) has been published this year: A total of 2086 direct jobs - have been identified in this study, in the field of marine energies, in France (75% on offshore wind and 25% in ocean energy). SCHOTTEL HYDRO is on schedule with the TRITON prototype to be installed at FORCE, Bay of Fundy (Canada). The 40 turbines to be installed on their platform are being manufactured in Germany. NEMOS, a German wave energy developer concluded the testing of its 1:5 scale model at DanWEC test site in Denmark, and is now progressing to a full scale prototype planned to be deployed during this year. A brainstorming session has recently been organized with key Indian stakeholders from the private and public sectors to discuss how to progress in ocean energy. BBDB, a floating device with an L-shaped OWC, continues to be the subject of investigation in India. Recently a new R&D project has been approved with the aim of developing a two-way impulse turbine and testing it on this device in the open sea. This work will be conducted by the Indian Institute of Technology, Chennai. OTEC is now a priority in India. The Government, in its new Financing Programme (2017-2020), aims to build an OTEC plant to power a 100 m3/day desalination plant in Kavaratti. In addition, the Indian Navy is investigating the feasibility of an OTEC plant in Andamans in the Bay of Bengal, with the technical support of NIOT. Ireland has been addressing the challenges of wave energy development in the country by creating test sites and laboratory facilities for different scale testing, introducing support mechanisms, and stimulating collaboration among industry stakeholders. OpenHydro development through a France/Ireland partnership and the OEBuoy progress through an US/Ireland partnership can be seen as examples of success partnerships. Marinerg-I, a distributed testing infrastructure united to create an integrated centre for delivering Offshore Renewable Energy, has started this year led by the University of College Cork, with 13 partners from 12 countries. It is a Horion2020 project that will run until 2019 with a budget of €2 million. This project aims to inform national and EU policy and investment strategies to capitalise on leadership in the ocean energy sector. The Kuroshio is one of the world's major ocean currents, in the south of Japan. IHI Corporation announced last year the development of a floating type ocean current power generation to use this resource. The company started the construction of a demonstration model of 100 kW (1:3.5 scale rotor size) to be tested at 30 – 50m depth. This project is supported by the Japanese funding agency NEDO (New Energy and Industrial Technology Development Organization). Since 2014, Japan has been progressing with the implementation of 6 test sites in selected locations for offshore wind, wave energy, tidal current and OTEC. Another test site for ocean currents, in Kagoshima, is under planning. An International Seminar on Ocean Energy will be held on 7 March 2017 at Saga University. CEMIE-Océano is the new innovation centre in Mexico, linking academic and industrial actors, devoted to applied research and technology development on ocean energy. CEMIE-O is building an R&D programme with 4 thematic areas covering all ocean energy resources with transversal projects addressing environmental aspects, materials, subsystems and components, network integration, training and international collaboration. The Principality of Monaco is committed to reducing its greenhouse gas emissions by 50% by 2030 in comparison with 1990, and to achieve carbon neutrality by 2050. To achieve these targets, the White Paper on Energy Transition has been published, bringing together the views, actions and expectations of key players in Monaco: 59 organisations and almost 90 people have been consulted. The issues and lines of action identified by the participants are presented in the document published on 23 March 2017. Seawater heat pump is a major asset for Monaco. Today, more than 80 seawater heat pumps operate in Monaco (publicly and privately). The total annual production represents 20% of the total annual energy consumed in Monaco. On 11-13 April, Monaco organised once again their international event Renewable Energies & Ecologic Vehicles Forum & International Conference. At EVER 2017, a roundtable on marine energies has been organised this year with the participation of OES delegates from UK, USA, China, Spain and France. The Portuguese Government has promoted this year an open discussion about marine renewable energies in Portugal, following their release of the roadmap prepared by an inter-ministerial group composed of academia and industrial stakeholders. Pico wave power plant in Azores produced 40 MWh in 2016 and is part of the MARINET2 European funded project initiated in 2017, a consortium of 39 partners, with a global funding of €10.6 million running for 4.5 years, aiming at the integration and enhancement of all leading European research infrastructures for wave and tidal testing. AW-Energy secured a €10 million financing contract from the European Investment Bankin Portugal, and is currently working on the first commercial 350 kW device, which is at the finalization phase. IST is progressing with the development of air turbines to equip wave energy plants of the OWC type: within the European funded project WETFEET, coordinated by WavEC, a new twin-rotor air turbine has been manufactured by IST and will be tested at Mutriku OWC. Further, within the European funded project OPERA led by Tecnalia, a bi-radial turbine has been build to equip the Spanish ¼ scale OCEANTEC sparbuoy-OWC. As a result of a pre-commercial public procurement tender launched by EVE (Basque Energy Agency) in 2014 and awarded to OCEANTEC in 2015, a floating oscillating water column device was successfully installed in October 2016 at BiMEP (Biscay Marine Energy Platform). It was connected to the grid in December 2016 and since then has been continuously working and survived to harshest winter sea conditions of the Atlantic Ocean. This device represents the baseline configuration for data and experience collection in the European OPERA project. Led by TECNALIA, OPERA aims to develop technology that would reduce the cost of operating wave energy devices at sea by 50%, accelerate the development of international standards and reduce uncertainties and technological risks. BiMEP, in operation since its inauguration in July 2015, has recently published a document that characterises its metocean conditions to be used in concept design processes or marine operation designs, within the TRL+ project in collaboration with IH Cantabria. PLOCAN also offers a test site for marine energy devices in the north-east of Gran Canaria Island. Two submarine electrical cables are expected to be installed in the first half of 2017 with an initial capacity of 15 MW. The Mutriku wave power plant is close to complete six years of continuous operation reaching a record of cumulative electricity produced from waves with more than 1.5 GWh injected into the grid. Besides that, Mutriku plant also offers test possibilities for OWC components. Two SMEs are testing components at BiMEP within the RECODE project (OCEANERA-NET funding). On one hand, Ditrel Industrial has started the trials of its electrical connector solution designed specifically for use with energy converters in marine environment. On the other hand, ZUNIBAL is testing an affordable oceanographic measurement technology based on GPS sensors that will allow the deployment and operation of a network of buoys. During the last couple of months the Swedish Energy Agency has been working on a marine strategy for guiding and prioritizing activities and projects for the Swedish Energy Agency in the area of ocean energy. A draft marine strategy has been published for comments and the final document is expected to be published in the summer of 2017. The national programme budget for ocean energy was around €5,6 million (53 MSEK) for 4 years and 16 projects have been approved. The Swedish company CorPower has just finished the dry testing of subsystems and are now starting dry testing of the whole system. A half scale device will be installed and tested at EMEC during late summer or beginning of autumn this year. The company has received funding from the Horizon2020 programme of the European Commission toghether with other partners – the so-called Waveboost project – with a focus on reliability and performance of novel direct drive PTOs. Further, within an approved project funded by Wave Energy Scotland the company will assess hybrid fiber reinforced polymer for point absorbers. The Swedish company Minesto plans to install their first full scale tidal device in Wales this year. Wave Energy Scotland has 2 years, funding innovative solutions to the technical challenges facing the wave energy sector: new approaches for Power-Take-Off (PTO) systems, novel wave energy converters, design studies on structural materials and manufacturing processes. A new call on Advanced Control Systems has been launched on 5 April. Meygen project plans to deploy up to 398MW of offshore tidal stream turbines in 2020. Phase 1A consists of 4x 1.5MW turbines installed at Pentland Firth. In the autumn 2016, the first turbine of Phase 1A was installed. Nova Innovation installed in 2016 two 100 kW M100 turbines in the Bluemull Sound and exported power to the Shetland grid. Phase 1 of the Shetland Tidal Array consists of three 100 kW M100 turbines, with more turbines planned in following phases. The Shetland Tidal Array is a joint enterprise between Nova Innovation (Scotland) and ELSA (Belgium). In Wales there are two wave and tidal demonstration zones – the West Anglesey tidal Demonstration Zone, managed by Morlais, and the South Pembrokeshire wave Demonstration Zone managed by Wave Hub. A number of projects are developing around the coast of Wales: Marine power systems Ltd, Minesto, Wave-tricity and the Tidal lagoon Swansea bay. This last one developed by Tidal Lagoon Power Limited will have 320MW installed capacity, with first power expected in 2018 subject to achieving planning consent. For the period 2014–2020, there are €100,4 million EU structural funds for marine energy in Wales. The UK Government opened on 3 April 2017 the second allocation of Contracts for Difference (CfD) auction where companies compete for the first £290 million worth of contracts for renewable electricity projects. Within the Wave Energy Prize competition funded by the U.S. Department of Energy (DOE), nine finalist teams, from an original pool of 92 registrants, developed 1:20 scale models of their wave energy technologies and tested at the Navy MASK basin. On 16 November last year, DOE announced AquaHarmonics as the winner of the Wave Energy Prize – which comes with a $1.5 million grand prize. CalWave Power Technologies and Waveswing America were awarded second and third place, respectively, with $500,000 and $250,000 in cash prizes. Sandia National Laboratories and the National Renewable Energy Laboratory are teaming to develop assessment methods and identify technical challenges, both common and unique to the US wave energy industry. This effort is known as Wave-SPARC (Systematic Process and Analysis for Reaching Commercialization). · OpenEI’s Water Power Gateway, a platform to share, showcase, and build upon databases, tools, publications, and interactive maps regarding developments in MHK. · MHK Data Repository with scientific and technical data generated by DOE funded projects. · National Renewable Energy Laboratory’s MHK Atlas, an interactive mapping tool for exploring the potential resource in USA. · Tethys, a Knowledge Management System on environmental issues. There is a new project aiming to engage the ocean energy community to prioritize improvement of existing databases. In December last year, Oregon State University’s Northwest National Marine Renewable Energy Center was selected for an award of up to $40 million, subject to budget appropriations, from DOE to develop, build and commission a grid connected wave energy test facility in Newport. In February 2017, DOE held a peer review meeting to evaluate DOE-funded ocean energy projects to assess progress made against stated objectives.